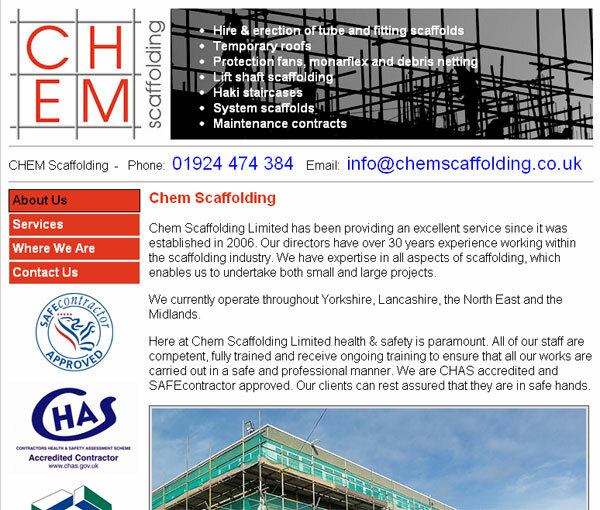 CHEM Scaffolding is a company based in Batley, Leeds, West Yorkshire. They operate throughout Yorkshire, Lancashire, the North East and the Midlands. They needed an on-line presence to advertise and promote their services and provide information and contact details to their prospective customers, and a means for their customers to get in touch via an on-line contact form. A small, quick, search engine optimised website was the order of the day, when CHEM Scaffolding came to Onsitenow Website Design of Leeds to get their website developed. "Thanks, we like the design and the website does just what we asked."